The world of Kaladesh is a living work of art, owing its bright existence to the tangible presence of aether. Aether is the raw magical energy that inhabits the space between planes in the Multiverse. While it's nominally present on many planes, on Kaladesh it's a critical part of the ecosystem. The life-giving energy infuses the natural world, sculpting the earth and waterways, drawing trees and plants into delicate twisting patterns, and attracting wild creatures like a magnetic force. Ever since the ingenious inventor Avaati Vya developed a process to refine volatile raw aether, it has also been inextricably woven into the world's culture of inspired invention. 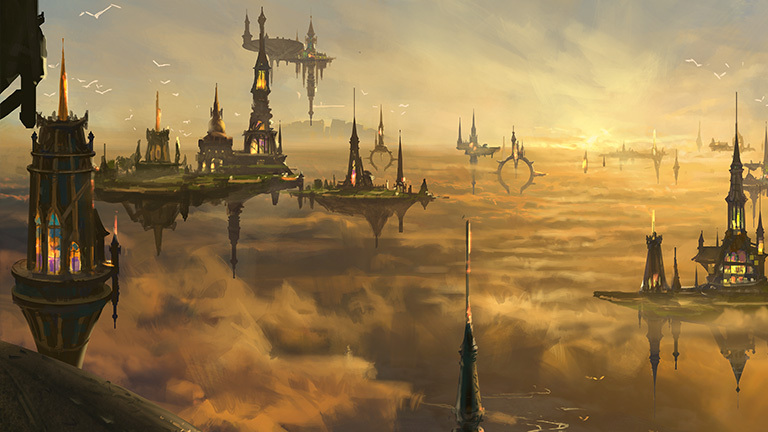 The Consulate, Kaladesh's governing body, recognized the potential of aether as a fuel and designed distribution methods to ensure that it was accessible to all. Their efforts led to a plane-wide inventors' renaissance, a time of hope, optimism, and boundless creativity. Now, clockwork automotons walk the streets, whirling thopters flit over the markets, and elegant gear-driven mechanisms raise and lower the very streets and buildings of the cities themselves. As bright and wondrous as Kaladesh is, it still faces its share of strife. A faction known as the renegades believes that the Consulate is infringing on their freedoms. They refuse to adhere to safety regulations and aether quotas, and they undermine the Consulate's efforts to provide structure and lawfulness. But renegade activity aside, this is a time of celebration. The Consulate has recently announced the Inventors' Fair, a month-long festival to celebrate the myriad inventions of the Great Aether Boom. Airships will race, automaton constructs will battle, genius minds will face-off, and elegant design will reign supreme. The head judge of the fair has installed the meticulous and diligent vedalken Dovin Baan as Senior Inspector, and Dovin has promised that the fair will go off without a hitch. He has recently elicited the help of the Gatewatch to mitigate potential renegade threats. Nothing will stop the people of Kaladesh from basking in the brilliance of their genius creations. A young dwarf renowned for her talent at the controls, Depala is a pilot with a reputation for pushing the limits. She belongs to the Derby Crows aeronaut society and works with its inventors to continually upgrade her ships, always vying to stay ahead of the competition. In her youth, Padeem was a daring artificer-duelist. She earned acclaim with her invention of self-repairing armor, which she parlayed into a career in armorcraft. Now in her fifties, the vedalken sits as the Consul of Innovation and shepherds fledgling inventors through the process of development, choosing which ventures the Consulate will fund and pursue. An incredibly gifted aether-seer, Rashmi's understanding of the interconnectivity of Great Conduit has given her a reputation as something of a mystical figure. She conducts her aetherological research in a massive roving Inquirium, where she strives to unlock the secrets of the Blind Eternities surrounding Kaladesh. The aetherborn Gonti is Ghirapur's most infamous crime lord. They preside over the city's only permanent night market, where renegades flock to obtain illicit goods and siphoned aether. Gonti entertains visitors and esteemed guests with their state-of-the-art airships, animal construct menagerie, and vast private collection of unconventional inventions. Oviya believes beauty should be at the heart of every invention. An acclaimed lifecrafter, she spent many years mentoring young artificers. But when she lost her wife, she took to working on her own designs in secret. She hired smugglers, including the Nalaars, to supply her with aether for her ingenious creations. As Consul of Allocation, Kambal supervises the distribution of aether, but he has brought corruption to his post. He manipulates his connections in the black market, strikes deals with aether siphoners, and has even bargained with the aetherborn crime lord, Gonti. Kambal will exert whatever power necessary to maintain his domain and his fortune. Pia and Kiran were Planeswalker Chandra Nalaar's parents. When Chandra was young, they were bright, passionate inventors who sympathized with renegade philosophy, believing that creativity should not be stifled. But Captain Baral made an example of them; for the crime of smuggling aether, he torched the entire village where they were hiding, reducing it to ash. When Chandra's Planeswalker spark ignited, she left Kaladesh convinced that her parents had been murdered by the Consulate. Pia is a notorious Renegade and Planeswalker Chandra Nalaar's mother. Both mother and daughter believed the other to be dead, killed at the hands of Consulate forces long ago. After losing her husband and daughter, Pia went from optimistic young inventor to impassioned revolutionary, vowing to challenge the Consulate and steer it away from tyranny and oppression. An elf cultivator from the forest region of Peema, Rishkar came to Ghirapur to experience the wonders of the Inventors' Fair. After witnessing the Consulate's crackdown, he found a new purpose; he would fight for free access to aether for all. He has become a fierce advocate of the renegade cause. Though encouraged by her parents to become an artificer, Kari yearned for more. After her expulsion from her apprenticeship, she ran away. Now, at fifteen, she's returned, a notorious pirate with a pet monkey, Ragavan, riding her skyship, Dragon's Smile. Kari lives for adventure, and is famous for Consulate raids. The aetherborn Yahenni knows everyone in Ghirapur, or so it's said. Both Consulate and renegade forces come to them for information, and they balance these delicate relationships with ease. Yahenni is charismatic and speaks in hyperbole, and they always know when and where the most interesting social events are happening. A rarity on Kaladesh, Baral is a mage. The Consulate considers mages to be dangerous and unstable, so Baral keeps his powers secret even as he hunts and arrests other mages. Over a decade ago, he called for the execution of the pyromancer Chandra Nalaar, and was severely burned when she disappeared in a blaze. Sram relates to machines better than he does to people, and he has an intimate knowledge of every part of the city. As Senior Edificer, it's his job to ensure the harmony of the countless moving parts that make up Ghirapur's intricate infrastructure. Well aware of the weight resting on his shoulders, he's obsessively vigilant. The largest city on Kaladesh, Ghirapur is a massive cogwork machine that comes alive with the power of aether. The city extends from the port district of Bomat, located at the confluence of Kaladesh's three major rivers, through a multitude of varied and distinct neighborhoods, including the bustling Eleven Bridges market district, the aviaries of Freejam, the metalworking zone of Weldfast, the cosmopolitan greenbelt of Kujar, and the artist colony known as Giants' Walk. Ghirapur was founded on the spirit of invention, and today it is home to the Consulate government, which strives to uphold the founders' principles of optimism, creative freedom, and hope. Lathnu is a remote settlement in the far north perched high on the Devra Cliffs; it can only be reached via vertical rail track, or a very long and strenuous climb. Lathnu's economy is based around mining and smelting the metals found in the mountains, which inventors throughout Kaladesh depend on to build their wondrous devices. Spanning tens of thousands of acres, the wild forest of Peema is home to a population of elves who are deeply connected to the flow of aether. Daily, aether streams dip from the aethersphere to wind through the flora and imbue the fauna. The plants and trees are more vibrant in Peema, and the creatures are stronger, faster, and livelier than their counterparts elsewhere on Kaladesh. An expansive region that was once solely devoted to farming, Vahd took on a new identity during the Great Aether Boom, becoming a hub of the aerowright industry. The wheat fields surrounding the villages of Panka, Cambi, and Maranjapur were cleared away to make room for runways, hangars, and workshops, and many farmers trained to become aerowrights and test pilots. Elves are deeply in tune with the flow of aether and the subtle ways it influences and shapes the natural world. Their inventions are inspired by nature and in turn they inspire others, offering a vision of progress that is elegant, efficient, and harmonious with the Great Conduit's aether patterns. The blue-skinned, twelve-fingered vedalken are known for becoming deeply engrossed in the theoretical nature of their inventions. They strive for perfection in design, though they readily admit-and rejoice in the fact-that nothing can be perfect. Instead, they delight in iteration and improvement; they're the innovators of Kaladesh. Dwarves believe that the beauty of an invention is almost as important as its function, and nothing is more beautiful than a device that functions perfectly. These meticulous artisans have an unparalleled work ethic. They rely on proven tools and methods, and they relish in the physical process of construction. While gremlins lack the hallmarks of a cultured humanoid race, they still play an important role in Kaladesh's society of invention. Driven by their insatiable hunger for aether, they eat through obsolete or defective (or sometimes fully-functional) inventions in order to access the trapped aether within. In this way, they liberate aether back into the environment, allowing it to be used again. Aetherborn came into being spontaneously as a byproduct of the aether refinement process. Their bodies are in constant flux, as the aether residue they're made of gradually dissolves and is reclaimed by the aethersphere. Thus, their lives are short. But rather than despair, they savor each fleeting moment, squeezing out every last drop of enjoyment. Dovin has an innate talent, heightened by magic, that allows him to detect all the flaws of any given machine. As a Consulate inspector, he uses his gift to correct faults in new inventions, but there are those who would rather see him use it to exploit weakness. Cunning and ambitious, Liliana is quietly growing more powerful by the day. And thanks to a contract with some demons, she's not growing any older. She wields the blackest of magic-necromancy-and is a master of animating the dead. Nissa is an elementalist uniquely and deeply connected to the land; this gives her access to overwhelming power. Though she has a cool, quiet demeanor, she erupts with fervent and powerful passion when the life of a world is threatened. A fierce competitor, talented metalsmith, and bright spirit, Saheeli is a renowned inventor on Kaladesh. She weaves seemingly endless threads of metal to form wondrous artifacts, and she can compel these lifelike creations to do her bidding. Compassionate but short-tempered, Chandra ignites with rage-and often flames-whenever freedom is threatened. Her natural pyromantic gifts and her consuming passion make her a fire mage of unparalleled power. Tezzeret is a power-hungry mage who employs his mastery of magical artifice to forge and command metal constructs. Driven by his quest for perfection and superiority, he enhanced his own body with the magical alloy etherium, which allows him to dominate in physical combat. Gideon values loyalty and honor above all. He's a tactically minded combat mage with the power of invulnerability, which gives him the edge in almost any battle. A champion for the innocent, he inspires others to follow him in his pursuit of justice. A brilliant telepath with insatiable curiosity, Jace strives to know all there is to know. His skills in illusion, mind reading, and memory modification make him one of the most talented-and potentially dangerous-Planeswalkers in the Multiverse.